Two French Purebred Arabian lifted the two Group PA races, which took place during the international weekend in Istabul, Turkey, on the 5 and 6 September 2015. Handassa (Madjani x Ziva by Dormane) won the Group 2 PA International IFAHR Trophy that was run over 2100 m and was open to three-year-old and older horses. 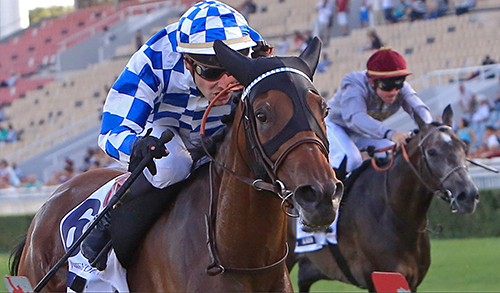 The five-year-old horse Handassa is owned and bred by S.A. Sheikh Hamdan bin Rashid Al Maktoum and trained by François Rohaut. He was ridden by François-Xavier Bertras. Hurra FR (Assad Saif x Hamiya) owned by Dr Mohamad Al Nujaifi and trained by Diana Dorenberg was the runner-up. Djet Taouy (Dahess x Win Taouy), owned by the Royal Cavalry of Oman and trained by Elisabeth Bernard, finished third. The following day, Ghazwa (Zawam x Gharnooga by Al Hasim) lifted the mile Group 1 PA International Malazgirt Trophy. She beat Mouheeb GB (Mared Al Sarah x Sandytiki) owned by Remazan Kaya and trained by Ayhan Kasar. Vulcain du Clos (Monsieur Al Maury x Jaama du Breuil) trained by Charles Gourdain finished third for his owner the Royal Cavalry of Oman. The five-year-old mare Ghazwa is owned and bred by Dr Mohamad Al Nujaifi and is trained by Damien de Watrigant. Jean-Baptiste Hamel guided her to victory.